New Russian-exclusive melee-only class, Spearman, based on Moscow Opolechnie, uses one-handed axe and spear, no firearm. If anyone has a suggestion for the Russian customs do let me know. Tell me what you think of my suggestions! I might make other threads of my suggestions for other factions. I actually love them all. The Officer looks incredible; and as someone who isn't hugely into the history and rather "does this look good for a video game?" - Hell yes to all of the above. Thanks, lol, thinking of doing one for the Austrians too. Good suggestions, I just want to comment a bit about your guard suggestion. I think that the Pavlovskiy Grenadierskiy Polk should be used as the grenadier class instead of a guard unit. The regiment didn't become a guard regiment before 1813, and they fit better as grenadiers imo. I think that they should use the Preobrazhenskiy Leib-Gvardii Polk as the guard. Here's a picture of the Pavlov grenadiers as they were from 1805-1811. That is true, though I am mostly basing these off a post-1812 army. Also Choosing Pavloski for the Guard kind of fits in with the pattern Anvil has been using of having a visually distinctive regiment for the Guard class. I would argue that the Preobrazhensky lifeguards are quite visually distinctive from the regular Russian line infantry. Officers only wore the gorget with the full dress coat (мундир) but not with the undress frock (сюртук) or greatcoat (шинель). There were several other regiments with green cross banners: Mogilev, Kostroma, Yakutsk, Nyslott, Okhotsk, Pernau and Simbirsk (green with red corners). Your suggestion for the rifleman is just another Jäger, albeit an NCO from a grenadier platoon. The Preobrazhenskiy Regiment didn't wear lapels before 1817. You've accidentally shown an illustration of the Guard's Lithuanian Regiment. If we get naval classes for a Russian faction, besides the obvious sailor, officer and marine classes, I would recommend the coastal fortress or coast guard class be represented by the Interior Guard, which absorbed the garrison units after 1811. They wore gray coats with yellow collars and cuffs and had black and orange cockades on their shakos instead of the brass grenades of the regular field infantry. I think the Riga or Cherson battalions would be logical candidates. I think these would fit better as the Rifleman. Russian officers look distinct enough with the shako, gorget, lack of shoulder belts, and sash. Realistically, they should either wear the mundir or sertuk (frock coat, similar to the Prussian Uberrock [ grey field coat, except the Russian one would be green]). 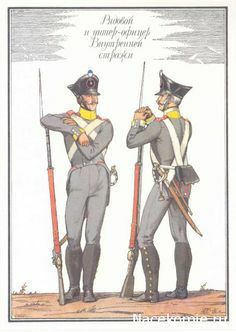 Seeing as the Guards recieved the saddleback shako first, they should wear the 1812 kiver (arrived in 1813) and the rest of the classes should wear the 1808 kiver with the 1809 regulation accouterments for the appropriate units. The 1808 overlaps with the use of the 1812 kiver and was far more common. Finally this should be the guideline for what the Light infantry should look like. Additionally, the Pavlovskiy Grenadierskiy Polk should be the Grenadier class, since all the guards in-game are technically Grenadiers anyway, and I think the Preobrazhensky Regiment should be the Guard class. The "rifle regiment" you have posted is just the 30th Jäger Regiment, so you are suggesting that the light and rifle classes look the same with perhaps only the shoulder strap and pouch number to set them apart. If Anvil really wants a rifle unit that isn't a generic Jäger regiment, they could go with the Riga volunteers, or the Black Sea Greeks, or even Catherine Pavlovna's marksman battalion. Several militia units also had old rifled muskets and carbines in their complements. Or they could pull the Albanian-Greek Light Infantry Legion of Corfu (disbanded in 1807) into the future through a wormhole and use them too. Russian colour-bearers were always NCOs and typically nobles serving in the ranks for 3 years before promotion to the officer corps, holding the rank of podpraporshchik (подпрапорщик) or portupey-praporshchik (портупей-прапорщик), but rarely the position could be awarded to a commoner. This was copied from the Prussian "Gefeit-Corporal" system by Paul I in 1796 and continued throughout Alexander I's reign. If an ensign is carrying the colours, something terrible has happened to the centre of the battalion line. I should also add while I remember it that the fifer must be a grenadier, since the musketeer and fusilier companies had none. There were only 8 per regiment before 1810, and then 6 per regiment after the reorganization (since the number of grenadier companies went from 4 to 3 and each had 2). Perhaps the pants could be white for the lights as well and yes I'm aware that's a Jaeger, it's just a more realistic suggestion. The ensign suggestion is only for distinction, not realism, although concessions already have been made in regards to certain faction's units by AGS anyway, as I'm sure your aware of. I think they should be NCO's but of course AGS may not do that. I should mention that I'm only basing these suggestions 70-80% on what is historically accurate and the other 20-30% on what looks good. That's why I have given them all 1812 saddle-back shakos, used a peasant as a potential Carpenter class and Pavloski as the Guard class, as well as the melee only spearman class just to get the Moscow Opolechnie. I do agree with a number of your suggestions, Sourkraut, especially the Rifleman and the Coast Guard. What the Foot Artillery should look like. Good suggestion, added to the list. Added the Interior Guard suggestion as the Russian coast guard, would like to find some good naval classes.